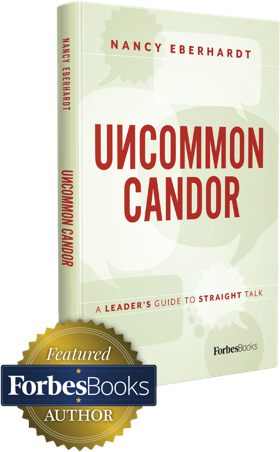 In my book, Uncommon Candor: A Leader’s Guide to Straight Talk (ForbesBooks), I make a strong case for candor that is direct and truthful, but also respectful. Conversations that are “brutally honest” don’t fall into the category of real candor. Earlier this week, I volunteered at the polls located in a middle school on election day. I was delighted to see the greatest small reminder of what good candor looks and feels like. It wasn’t about the candidates, ballots, election or political parties. Rather, it was a small sign displayed as an on-going prompt for the students – an outstanding way to nurture the candor they’re born with, and a solid start to cultivating how they grow up and grow into adult-like candor. True… Are you speaking the truth? Valuable candor is rooted in facts and authenticity. Helpful… Are your intentions helpful or hurtful? Although it may feel uncomfortable, real candor has a helpful outcome. Important… Are you focused on what is critical right now? Direct conversations must include the important details and leave behind the fluff and distractions. Necessary… Are you considering what is relevant and what isn’t? Strong candor gets right to the heart of what matters most. Kind… Simply, are you playing nice in the sandbox? Respect and good intentions are the root of good candor. In today’s world where we’re often so quick to blurt or tweet an immediate response, we should use this elementary reminder to stop and consider our words and intentions. Perhaps we need this sign in every breakroom, conference room, corner office, congressional building, and the White House? Maybe then we’ll be able to communicate in open and productive ways that generate positive change and improvement. Thank you, teachers, for reminding us to THINK.